This is what we are shooting for…a delicious breakfast at Tsukiji Fish Market in Tokyo! How did we get here? How do you see the world famous tuna auction? Visiting the world-famous Tsukiji Fish Market is on everyone’s top to do list for Tokyo, in fact in Japan. It’s a fascinating glimpse into the workings of a real fish auction as the night’s catch are delivered early in the morning to the market, auctioned off to middlemen, then sold in the outer market to either fish shops or restaurants for hundreds of thousands of dollars. The fresh fish sometimes only makes its way across the square to become the best breakfast in Tsukiji Fish Market. 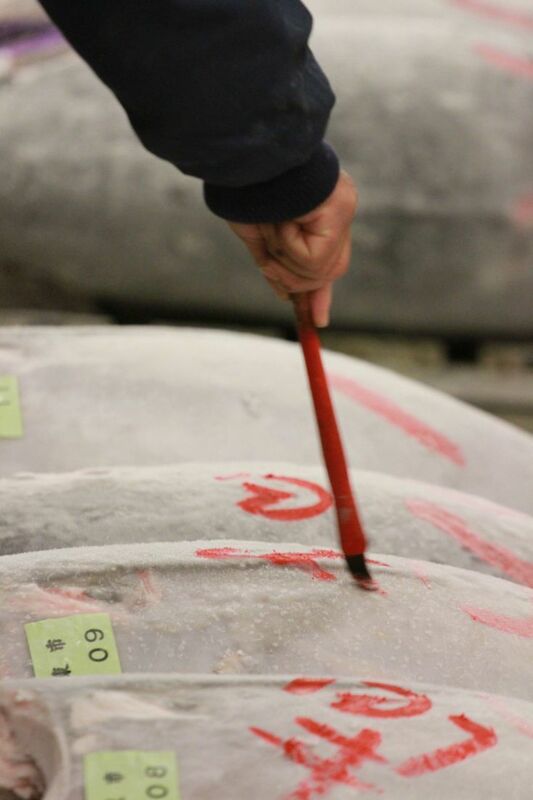 If it’s on your list, you will want to know all the ins and outs of how to visit Tsukiji Fish Market in Tokyo, including seeing the tuna auction. But you better hurry, this Tokyo landmark will be closing in October 2018 and moving to a new location. 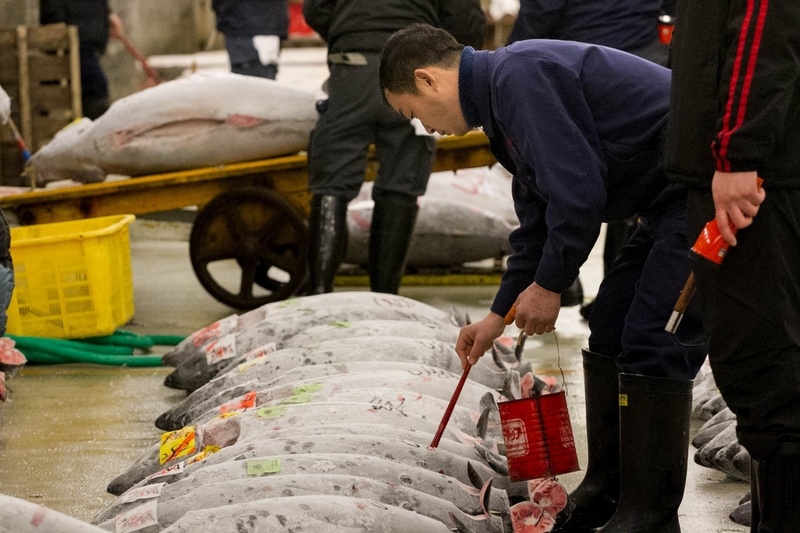 Why is Tsukiji the Most Famous Fish Market in the World? Is Tsukiji Fish Market Moving? 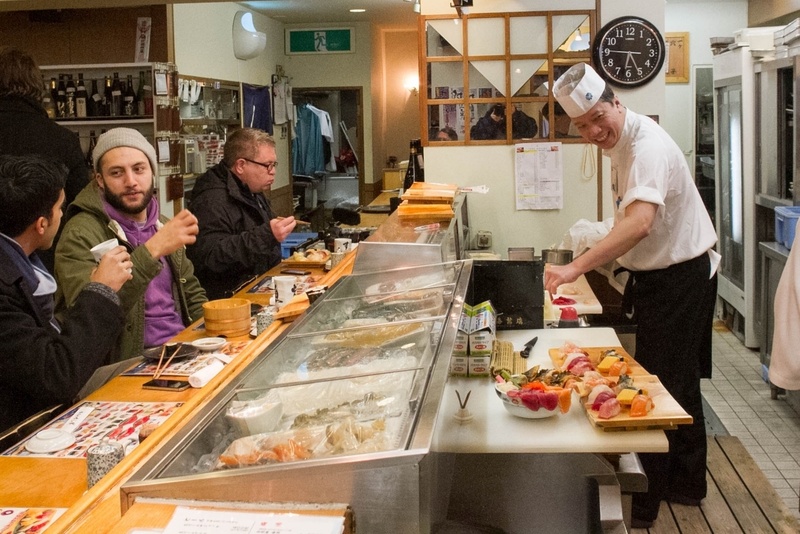 How would you like to eat sushi for breakfast at the Tsukiji Fish Market in Tokyo? It’s simple. 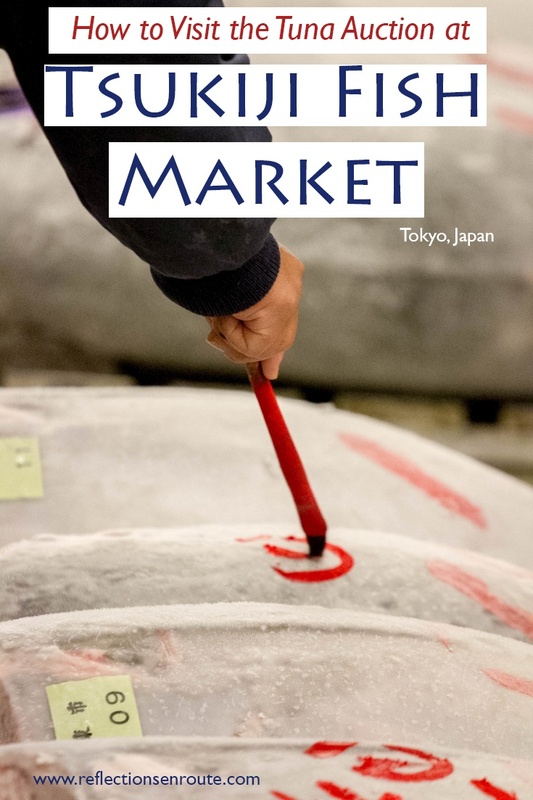 Tsukiji Fish Market is not only the biggest and freshest market, it brings in the most revenue on a daily basis. 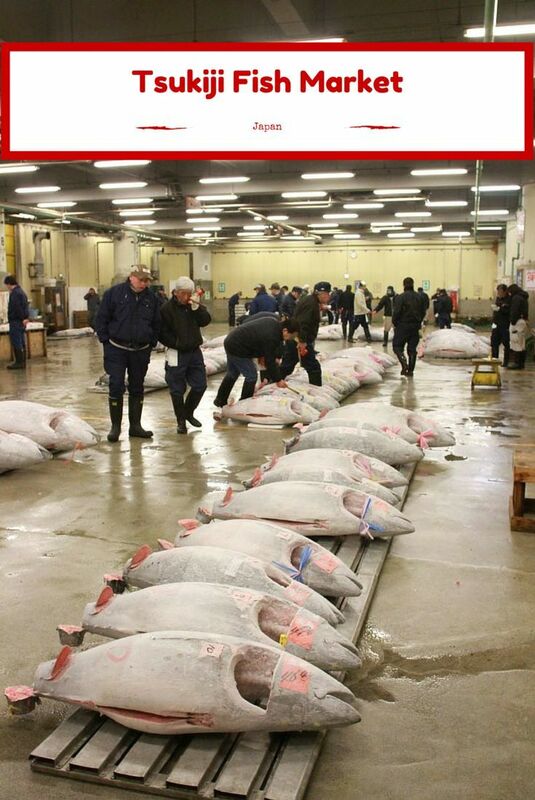 Tunas ranging upwards of 400 pounds have sold for over $600,000. It’s mind boggling! Far from the only fish market where you can watch a live tuna auction, it’s definitely the one with the most serious, expensive fish. It’s all business as the auctioneer rings his bell to sell the next lot. Tsukiji Fish Market has been a must-see tourist attraction for many, many years, but you’ll have to go soon, or you might miss out. By 2018, this market that sells over 2,000 tons of fish per day will be moving to a new spot in Toyusu. Concerns about aging infrastructure started the call to move the fish market, but the upcoming Tokyo Olympics in 2020 are really driving the decision now. The area is slated to become one of the venues and the work needs to get started soon. Not too long ago, you could get up early and walk around the entire area, free to roam where you wanted, but times have changed. Due to safety concerns at the marketplace, the Tokyo fire department has imposed new regulations on the fish market, which has led to some major changes on the visiting procedures. First, you make your way to the Osakana Fukyu Center (Fish Information Center), where they welcome you, and you begin to wait in line. The address is: 5-2-1 Tsukiji, Chuo-ku, Tokyo. The main issue is that having to arrive so early at the market, there is no public transportation, so we highly recommend that you stay in the vicinity the night before. Below we’ve listed some great hotel options close to Osakana so you can walk over early, and go take a nap after your Tsukiji Market breakfast. What you are waiting for is to enter the auction area, and there are only two viewings, one from 5:25-5:50 AM and the second from 5:40-6:15 AM. Only sixty visitors are allowed in each viewing (120 total per day), and since the opportunity to visit the auction may soon go away, this means getting in line very, very early and waiting. We arrived at about 4:10 and our numbers were in the thirties. They were already half filled. We were given some papers with a map and rules on it as well as a fluorescent yellow vest. The second viewing visitors wore blue vests. Then we waited, and waited, and waited until it was time for the doors to open. Once they did open, we were hurriedly pushed through and marched to the auction area. This is a no fooling around, serious event. There are rules, and if you don’t follow the rules, you are out. Get in line at Osakana Fukyu Center very early, at least by 3:00 AM. Vests are on a first-come, first-served basis. No food or drinks are allowed in the waiting area or the auction area of the market. No touching the tuna or anything else. The tuna warehouse is cordoned off by rope. The sixty of us were sardined into a corridor about 4 feet wide by 30 feet deep. Here we pivoted, trying to watch the goings-on which were all around us. As you enter, the tuna are all lined up in a row on the warehouse floor–noses pointed all in one direction, and a small piece of flesh cut in the tail, where the buyers inspect the meat. They are, of course, interested in the color, the fat content, and who knows what else. It didn’t take them long to wield their ice pick, flicking up the flesh and taking a quick look at it to determine whether they wanted to bid on it or not. 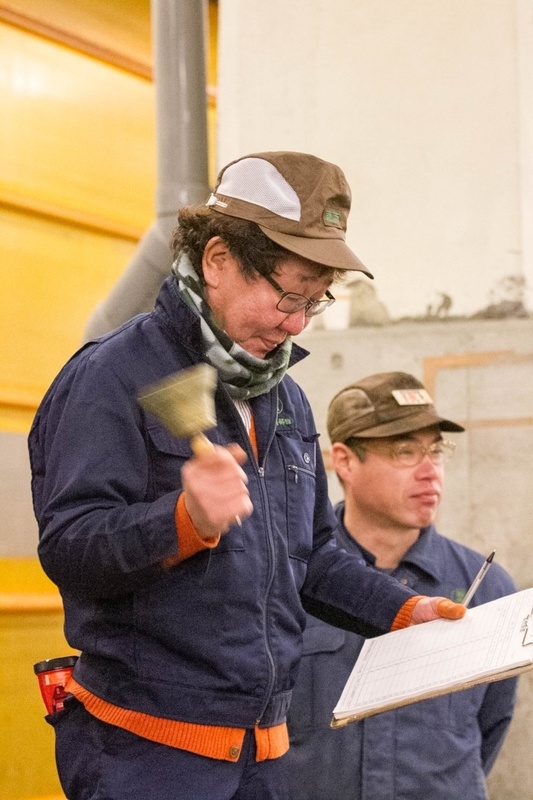 After some time for the inspections to take place, the auctioneer pulls up his stool, takes his bell in hand, and begins ringing it fast and loud, commanding all to look his way and get the bidding rolling. A fast-paced auction, they had sold off at least five of the large tuna before I realized what was happening. The auctioneer starts the ball rolling and the buyers each bid using their own set of hand signals. My favorite was the man with his two fingers, waist-high, just making a continuing more, more motion. Apparently, he would pay almost any price for the fish he found worthy. Once a price was settled upon, the tickets were collected, the name of the company was painted in red on the fish’s side, and before we knew it the whole room had been sold. Each lot took about five minutes. It was quick, furious, serious, and completely awe-inspiring. Watching the auction was one of those times in life that you are witnessing something you just don’t have the background to completely understand. This was a look into the fishmonger’s life, where everything is spoken in their own language, the language of fish and fat and yen. We watched two lots being sold, then were ushered quickly and determinably out the door. No stragglers. Hurry. They’ve got more work to do, let alone another full group of visitors to deal with. As we were ushered out the door and through the alley, we had to watch out for the little trucks, called “turret” trucks, that were used by everyone. A cylindrical motor and driving console, it was basically a moving pallet; efficient and a bit scary when they are heading straight for you. We hurried by stall after stall of people packing the fish in Styrofoam boxes, by the pile of boxes, by the stalls that sell the fish meat as well as all things to do with eating fish, like pickles and spices, and who knows what else. We peeled off our vests, handing them unceremoniously to the collector and we were finished. Pickled vegetables on sale in the Outer Market of Tsukiji. A temple just outside of the fish market area beckoned to us. Poorly lit, but obviously well-cared for and containing some important tributes to the deities, people were there clapping and praying, most assuredly thanking the gods for their bounty, and hoping the next day offered the same. After we left the temple, we walked down the street and found an open sushi restaurant, called Yamazaki Sushi. This was the prize at the end–fresh sushi, the freshest. We entered the brightly lit establishment with promises of a “breakfast special” for only 2790 yen that held many of the market’s treats. We ordered it, but we also had to add a few extras. I’d heard that the Uni (sea urchin roe) was best fresh when off the boat. I’d never had an urge to eat sea urchin eggs before, but this was definitely the time to do it. It was a sweet taste of salt water and the ocean and, along with the other sushi we had that morning, the perfect end to our trip to the famous fish market of Tokyo. 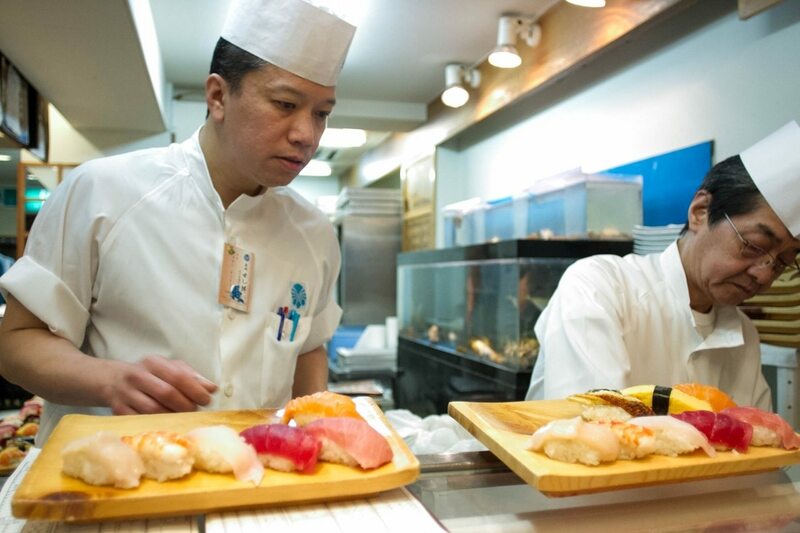 There is no shortage of places to try the freshest sushi you’ll ever have. As I mentioned we were drawn in by the special advertised so early in the morning at Yamazaki, and it was an experience both watching the men prepare our morning feast, but also the different types of sushi that we hadn’t tried before. It was delicious! Power Tip: When it comes to eating out in Japan, be adventurous! 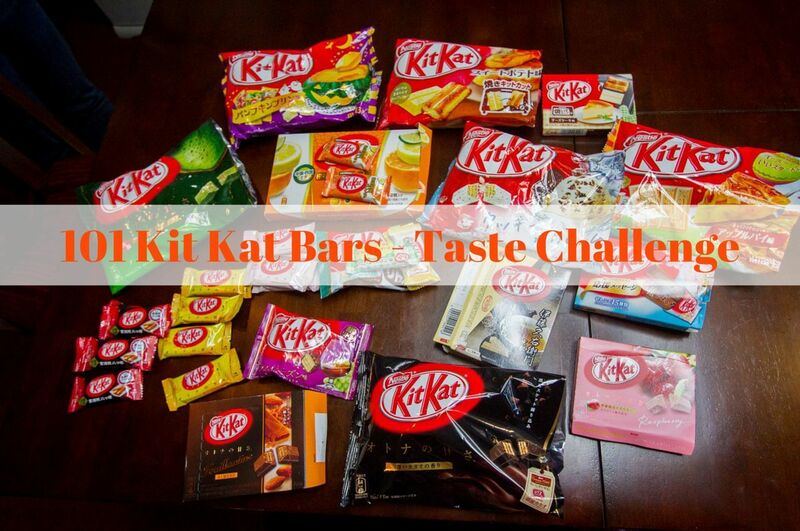 Check out our incredible food of Japan article for more tips and suggestions! The short answer to the fish market changing addresses is yes, it is. Originally it was supposed to move November of 2016, but the new move date might be October of 2018. 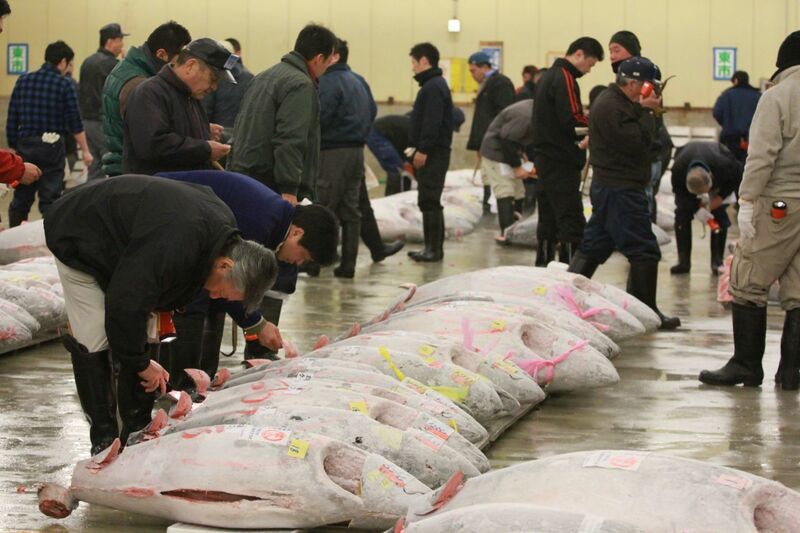 Not only will the entire market move, the tuna auction will change considerably as well. Where as now it is done the old way, by auctioneer and hand movements, the new market should have some pretty high-tech capabilities. It will not be the same experience at all. The new home of the market will be the Toyosu Waterfront. We’ll share more details as they become available. 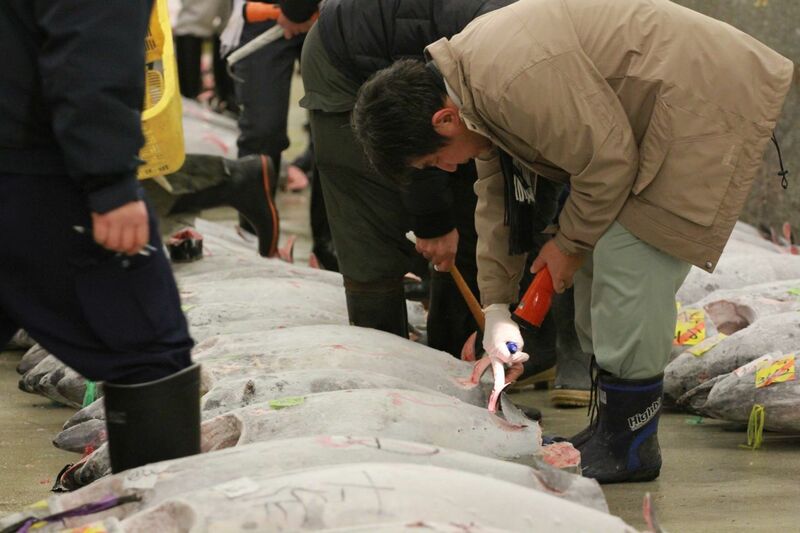 Check out the Tsukiji Fish Market website for more details: http://www.tsukiji-market.or.jp/tukiji_e.htm. Open Mondays through Saturdays with the exception of Wednesdays and national holidays. Check the calendar before you make the commitment to getting up early. If you want to be on the morning fish auction tour, it opens at 5:00 for handing out vests. However, the line starts long before then. The outer market is open from 5:00 AM- 2:00 PM each day, but since there are many individual vendors, not all will be open at the same time. If fish isn’t your thing, no need to worry. 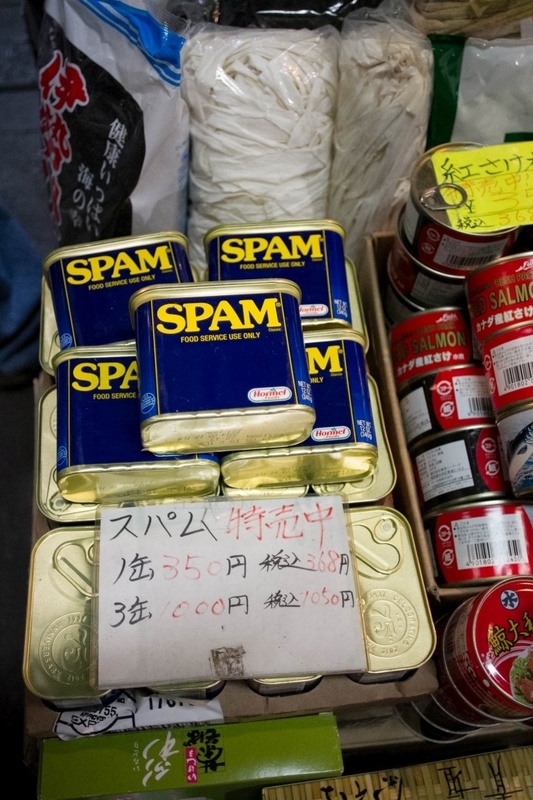 There’s plenty of other products, food, kitchen supplies, you name it at the Tsukiji. No matter what time of year you are going it can be very cold. First of all, the fish must remain iced, so the warehouse is always cold. 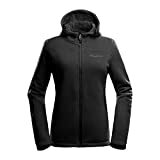 So, take a jacket and layer up. If it is winter, and you will be standing and waiting for the Osakana Fukyu to pass out your vest, you will need hats, scarves, and gloves. It can get frigid. 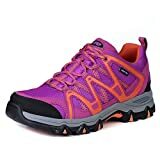 Another consideration is your shoes. It’s a fish market and there is water, machinery, and plenty of standing around. 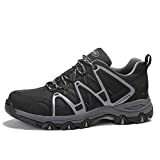 Wear comfortable, closed-toed shoes. High heels are forbidden, and who would want to wear them anyway? The trick to getting a good hotel in Tokyo is simple. 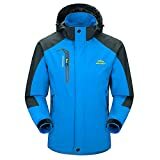 Look for decent review ratings that mention comfort and then check location. You don’t to be too far from a metro station. Here are some Tokyo hotels in the Ginza district that fit the bill and are good value. More Reading: Take a look at our Top Tokyo Attractions article for more tips and advice on visiting this energizing city! 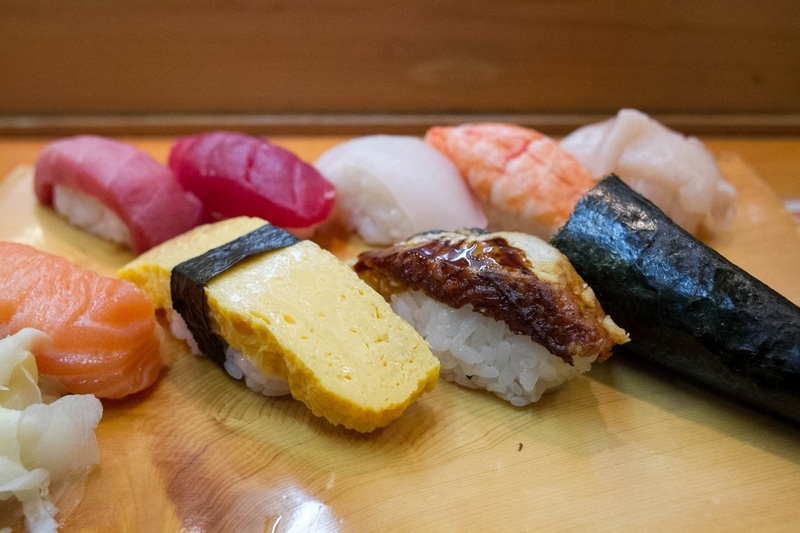 I enjoyed reading your experience at Tsukiji very much! I stumbled upon your blog while I was researching about the fish market. I am a photography hobbyist and I will be making a trip to Tokyo next week. During my limited time in Tokyo, I plan to watch the tuna auction. In order to maximize my photography opportunity at the tuna auction, I would like to know how far (approximately) were you standing from the auction area, and should I use my 18-200mm lens or my telephoto 70-300mm lens. I am choosing between the two because I don’t want to bring too many lenses, as I will be bringing another glass lens (24-70mm) as well, which is very heavy. Also, while the auction is underway, is it okay to photograph the entire process? Your valuable time and input in answering my questions are greatly appreciated. Thank you! Shirley, No problem. I took my 18-200 which was perfect, because you have to stay on a path and sometimes it is closer than others. Plus that way, even close I could get some detail shots. You are allowed to photography the entire process. I’m pretty sure even flash was ok. It isn’t the best light, of course. The hardest part was trying to figure out where the shots were and jostling around the other people on the tour. Make sure you get to Tsukiji even earlier than they suggest so you are closer to the front of the line. Good luck. Let me know how it goes! Tom, It is frustrating that you have to be very early to get in line, especially in the summer! This is so cool. I hadn’t heard that it was moving – I would like to see it before it goes but I doubt I’ll be able to. I’m afraid when they move to the new more tech process it won’t be the same. The sushi looks amazing though! Nathan, You never know. It might be even better. Anyway, the sushi breakfast will still be fresh and amazing. Of that I’m sure! I’ve seen shows about this fish market, but somehow I missed that it was the largest in the world. It would be quite an experience to see the market and the auction, and the hubs would love the sushi shops. Not sure if we will make it there before it moves to a new location as Japan is high on our list, but not in the cards for this year. Thanks for all the handy tips! Lara, It is a spectacle, and it’s well worth the trip. I’m sure it will be just as interesting when it moves. It might even have more high tech integration which would be fascinating. What a chance to see the Tsukiji Fish Market, the biggest and freshest market and the one that brings in the most revenue a day in the world, through your post! Those tuna are huge! Carolina, It is a spectacle. We totally enjoyed it. Waking up early just adds to the charm. Great guide. i went maybe 15 years ago?? I want to go back as an adult. Sushi for breakfast was incredibly memorable. Amy, Yes, I’ll bet it’s changed a bit since then! Love sushi…really anytime. I’m going back! I have a 20-hour layover in Tokyo! Enjoy it Amy! How fun! This post devoted to the Fish Market was so interesting! The auction must have been the highlight of the day. I can imagine al the buzz and the excitement. Breakfast sounds delicious too. 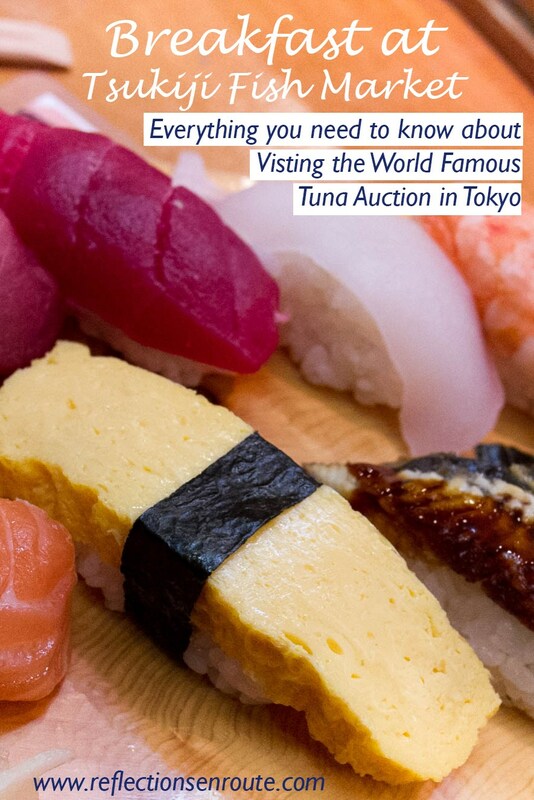 Punita, Watching the auction, eating sushi for breakfast…the perfect start of our day in Tokyo! I’m going to Japan in September. I’m very excited – it has never really been on my bucket list and then all of a sudden I decided to go. After reading this, I think I’ll be eating really good – yet ‘exotic’ – and very healthy for three weeks – another thing to look forward to. Renata, There is so much great food in Japan. I have another post all about the food. Check it out if you like. Such an amazing local experience this is! Different and so educative! While most of the times I have read about where to find the best sushi in Japan, your blog post gave me an insight about the market! I never knew about the Tsukiji fish market and the revenues! So good to know there is a fish information centre as well! Pity it is moving and tourists won’t have the same experience! Well, we just don’t know what the experience will be, but I’m on the job and will let you know! Tsukiji is high on our list when we make it to Japan. Interestingly, the owner of one of our go-to spots in our neighborhood used to work at Tsukiji back in the day. Being able to eat all of that fresh fish would be a dream! Didn’t realize it was moving locations – wonder how the new spot will be. How cool is that? I always love it when I have a personal connection to a place before I visit. It makes the experience that much better from the get go. If it’s the biggest and freshest market… I’m sold! 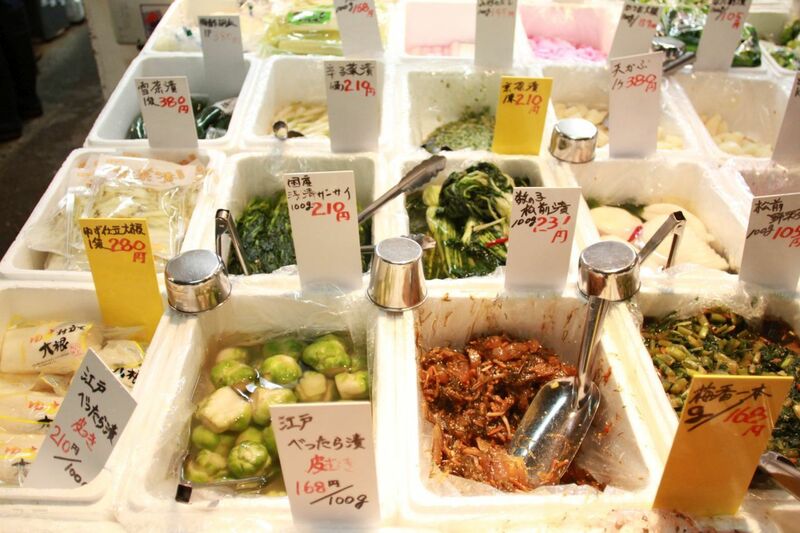 It is my dream to go to Tokyo and this market would be on of the first places on my list! Thank you for including some hotels that are nearby. Carmen, Yes! If you go, let me know! I’ll be living near Tokyo pretty soon! 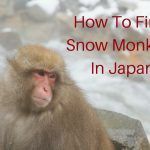 Marteen, Japan is a fantastic place to learn! It’s all safe. Marteen, I hear you. Once I ate a very special Japanese squid dish. They were so proud of it. It was beautiful, but yeah, not for me.